Above, members of the Wild Women of the Water at the 50th Annual Federation of Fly Fishers International Fair on East Lake in 2015. Below, the Wild Women fish on a beautiful Central Oregon river. Back in 2003, Delores Marsh, with the prodding of then-President of Central Oregon Flyfishers, Dan Driskill, started a women's-only fly fishing group, now named the Wild Women of the Water. The original group was only three members, but has grown to 60 strong in its 15-year existence. "It became an idea in early 2003 and we had our first real meeting in September 2003," Marsh said. "How it originated was, I was on the board of directors (for COF) and all of the fellas wanted to have their wives or their significant others fish, but the women didn't want to have a man teaching them. And so Dan wanted to know if I wanted to start a women's group and I said, 'I don't know how to fish well enough.' And he said, 'Well, you'll learn.' And I did." I was fortunate to sit down and chat with Marsh and three other members of the group, current COF board member Kari Schoessler, Mary Ann Dozer—a guide through the Fly Fisher's Place in Sisters—and Lee Ann Ross, the group's retiring president. As a lifelong angler lucky enough to have a grandfather to teach me fly casting about the age of 8, I'm always interested in what gets people into the challenge of catching fish the hard way; no bait, just hand-tied pieces of feathers and yarn, painstakingly wrapped, tied and glued to the body of a hook, then flung into the current by a noodly rod and floating line. "[My husband and I] met in Yellowstone Park. He had always fly fished and did a trip once a year with the guys and I finally said, 'I'll try it,' and it went from the stupidest thing he did, to he's in the dog house for not doing it sooner," Dozer said, chuckling and getting a laugh from her friends, sitting around a square table at Jackson's Corner. "I started in probably my early 40s," Marsh said. "I was hiking in the Sawtooth Mountains and I was with people who fly fished and I said I wanted to learn, so for my birthday I was given a Cabela's rod—a cheap rod—and every time we went hiking, if there was a lake around they gave me a little lesson and I just started from there. Marsh has since fished in Patagonia and Africa. Now, the inexpensive department store rod doesn't work for her any longer. "I make my own," she said. Schoessler said her father handed down all his gear to her and her husband when he retired from fishing. "I've been fishing with him since I was 5, but he would catch all the fish," she said. "My husband wanted to get into it, so we started about 10 years ago." She said they now fish together often. Ross lived abroad most of her life, fishing in places such as Kenya, then moved to Bend for the skiing, but got injured and turned to fly fishing. "I broke my hip skiing at Bachelor in 2005 and didn't have anything to do, so I took the COCC fly tying class, cause you can sit and tie and you don't have to walk," she said. "Then I took the spring [term]. They used to have a fly fishing class through COCC, and I just started from there and I've been fishing since then and had a lot of fun." The Wild Women don't just teach other women to fish. They also spend a lot of volunteer hours with kids in Central Oregon. "We have this group called Next Cast," Ross said. 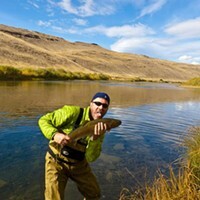 "We wanted to get more kids into fly fishing. If you look around, or look at any club anyway, it's predominately retirees, and clearly the middle-aged people are out there fishing, but we wanted to get more kids fishing." The Wild Women help with the Kokanee Karnival, an annual program for 4th and 5th graders in Central Oregon providing river and lake stewardship education. But, Ross said, they wanted to find a way to get rods and reels into the hands of youngsters. "Bend Park and Rec for years has run a two-day camp after school's out. We [COF] ran it for a number of years and then we had a hiatus, but we've re-started it again and we've run a whole slew of kids through there," she said. "I think we have 20 super active kids now and they tie flies—they could tie flies for me anytime—they tie better than I do," Ross said.